It wasn’t until my Mum died that I was able to let myself ‘feel’ my little girl again, to recognise my childhood, my younger self. So much of my adult life, teenage-hood and the latter years of my childhood were steeped in the business of being brave, paving the way and forging ahead. It was something that was not only instilled through family circumstance but biology. It’s always been in my make up to not give in. To keep trying… To go forward, to make things work, even at the cost of my well being or happiness – something which, as I grow older, I am at odds to sacrifice given what I know now of life and how it works. But I find myself now, while somewhat perturbed, also extremely delighted and heavily relieved to welcome back this little girl. Hello! It’s been a while.. How are you.? I’ve missed you… Thank you for waiting for me, you’ve been very patient. 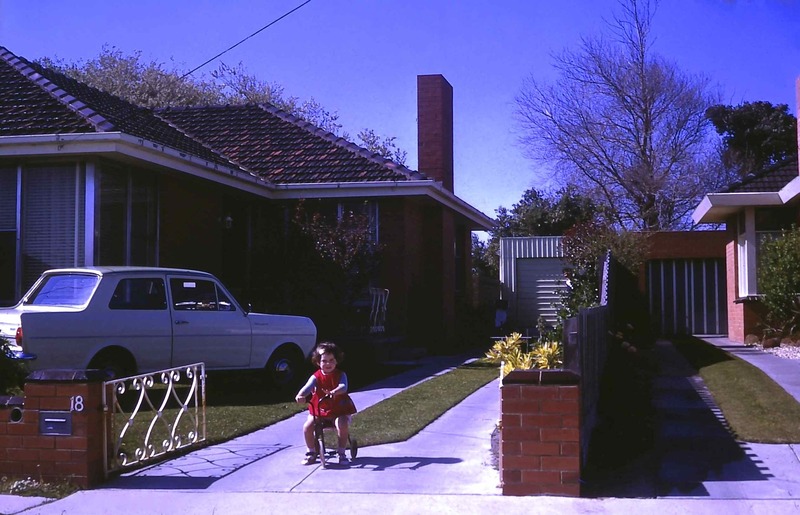 I love this photo of me at three in front of our ‘first’ family home set deep within one of Melbourne’s then newly-minted bayside suburbs which flourished in the late 1960s. The streets were paved with the hopes and dreams of young couples emerging from families scarred by two generations of war and going without. Brick by solitary brick optimism was slowly built into each two-bedroom residence and back into our national psyche. That’s what I see oozing from this Kodachrome slide taken by my Dad who is still to this day the perfect suburban snapshot photographer, and my greatest photography teacher. Stone fruit trees punctuated our backyard. ‘The beach’ was just up the road. My yellow-bricked ‘kindy’ was just around the corner and the shops, including the revered milk bar, was conveniently located at the end of our street. Friends lived in the neighbourhood. We could play on our wee trikes and scooters out the front with other kids who lived along the avenue. ‘Aunty Marge’ with the purple hair lived next door as did other older ladies ‘Jean’ and ‘Ruth’, in the court across the road. They were part of our suburban neighbourhood family and Mum’s nexus of older role models and support. And the ‘holy’ golf course was over our back fence, the place where both my parents spent much of their time developing their social lives with the parents of kids in our street. They couldn’t believe their luck. It wasn’t perfect and I’m not trying to be nostalgic; it was the start of the 70s and very soon marriages started dropping like flies. Some of these kids would grow up to be delinquents and after a few years we moved away: Mum was convinced we’d end up joining the teenage gangs that had started pouring out of the local high school. She was probably right. Regardless of what this image looks like I feel such kinship with this image – that’s what makes it powerful. These are my origins, writ large on glorious reversal film, vividly distilled in a single still image, snapped innocently on a Sunday afternoon. I’ve spent a good deal of my life pushing these origins away, editing them out of my psyche, forgetting details and paying them a criminal lack of attention. But here they are, so simple and bold and colourful! I welcome them back now – I crave them; I need them truth be told. Thank you Dad for taking this photo; for making this record of my early life; for preserving me as only a parent could (and as only a child could discard with such abandon.) You knew I’d need this one day as certainly you have needed such early photos of yourself, all small and vulnerable and new to the world. You knew. It does my heart good to be given the chance to see where I am from, through the eyes of another – the perfect photographer’s eyes, working with the dual might of intimacy and distance. I’m so happy to see her again, this little girl – so happy in fact, it makes me weep and smile in powerful unison, like listening to a cherished song from long ago. A version of this essay also appeared in Mamamia.